Award-winning actor and staunch eco-activist Leonardo DiCaprio is launching a new project: transforming a small island off the coast of Belize into an eco-resort and conservation area. He purchased the 104-acre Blackadore Caye with a partner nearly 10 years ago, and recently teamed up with NYC-based Delos developer Paul Scialla to create the luxury resort, which is slated to open in 2018. The plan is to make this a “restorative island”, which refers to both calming effect it will have on visitors, and how the island itself is being replenished. Blackadore Caye has suffered from overfishing and coastline erosion over the years, the latter of which has been exacerbated by the over-harvesting of its native mangrove and palm trees. Since the island is so close to San Pedro, the palm trees on the Caye have been uprooted to decorate hotel grounds in the city, while fishermen have cut down the mangroves to smoke their fish on the island before heading back to the mainland to sell their wares. 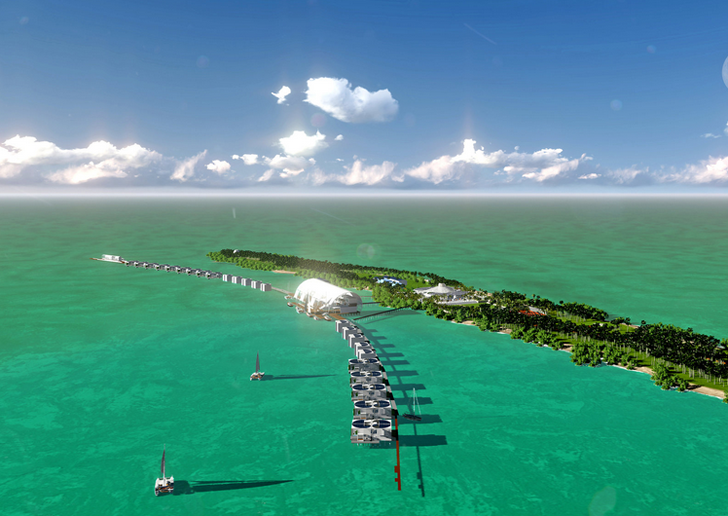 The eco-resort will be created as an enormous arc-shaped platform in the water, which will dual as a protective cover for fish shelters and man-made reefs beneath it. Plans are underway to remove invasive plant species so the land can be reforested with its indigenous mangroves, and a nursery is being built on the island that will grow native marine grasses. These will be transplanted around the island with the goal of forming a manatee conservation area, and the entire project will be monitored by a team of scientists, designers, and engineers. They, along with the landscape architects hired to restore the island, will monitor the resort’s impact on the island’s surroundings. DiCaprio‘s goal is to “…create something not just environmental, but restorative; a showcase for what is possible.” Instead of just creating a low-impact, eco-friendly vacation spot, the plan is to improve the area and leave it in better shape than how they found it. There will certainly be a blending of eco-stewardship and luxury living on this island: in addition to the guest villas, there will also be a number of private luxury residences for sale around the Caye, ranging in price from $5 million to $15 million. 5 million to 15 million price tags to stay? Embarrassed to see Di Caprio daring to call himself an environmentalist. He is an elitist eco con man. Climate change is already causing sea level rise and stronger storms that are devastating islands like Vanuatu and effecting mainly the poor. What poor person on Vanuatu or in the Philippines who lives on less than 2 dollars a day could afford such hypocritical bs disguised as environmentalism. People like Di Caprio are just as damaging to the climate/environmental movement as oil companies. Sick of elitists thinking they are doing so much for the world when all they do is use environmentalism as a shield for their own comforts. What an amazing island such a shame a developer has to get involved. The design itself is hideous, divorced of any ecosystem or subtlety needed to inhabit such an environment. A heavy handed and ignorant proposal, such a pity as I believe there is good intention in it, the way it is presented makes him seem fake. Award-winning actor and staunch eco-activist Leonardo DiCaprio is launching a new project: transforming a small island off the coast of Belize into an eco-resort and conservation area. An aerial view of the Blackadore Caye. Some beaches will be replenished with native marine grasses to provide manatee conservation areas. 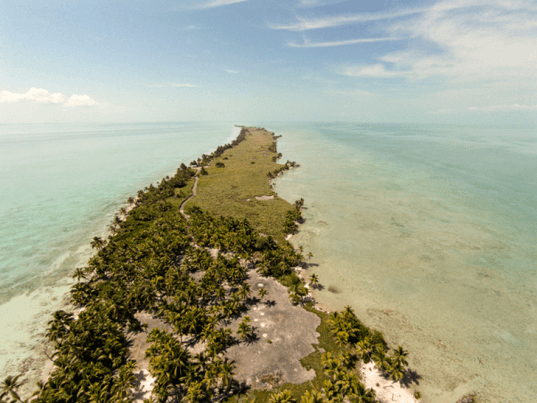 Award-winning actor and staunch eco-activist Leonardo DiCaprio is launching a new project: transforming a small island off the coast of Belize into an eco-resort and conservation area. He purchased the 104-acre Blackadore Caye with a partner nearly 10 years ago, and recently teamed up with NYC-based Delos developer Paul Scialla to create the luxury resort, which is slated to open in 2018. The plan is to make this a "restorative island", which refers to both calming effect it will have on visitors, and how the island itself is being replenished. Erosion visible along the island's coast. A 3D rendering of one of the private luxury homes on the island. They'll range in price from $5 million to $15 million. A caretaker's cottage on the Caye.